Oregon City High School's Erich Nova isn't the biggest big man around, but the Pioneers' 6-foot-4 senior post knows his way around the basket -- at both ends of the floor. Nova scored six of his game-high 13 points in the fourth quarter and helped anchor a stingy Oregon City defense that carried the Pioneers to a 48-34 non-conference home win Friday over Clackamas. Corban Remsburg was the only other Oregon City players to score in double figures with 11 points for the Pioneers (2-0). Artur Gavrilovich finished with 10 points to lead the Cavaliers (1-2). Clackamas was still within striking distance when Gavrilovich hit a runner in the lane to open the fourth quarter, pulling the Cavaliers within two points, 31-29, with 7:49 remaining. The Pioneers then worked the ball down the left side of the lane to Nova, who spun to his right and scored, sparking a 17-4 run that decided the game. "That was wonderful," Nova said. "Playing with this team, they made everything fun for me in the post, and then I'm kicking it back out so they can get open shots. It's just really great out there. "I think there's always room for improvement, but I think we played pretty well tonight. We got it done, but like I said there's always room for more." Nova sat out most of the past two seasons with injuries, but is healthy now and helping set the standard for how the Pioneers want to play in their return to the Three Rivers League. "It's great to have a guy like that," said Remsburg, the senior guard. "He's big on the boards, he locks us down in the middle, he's tough, and he plays really hard the whole game. "He was great tonight. He had some nice moves. It's just nice to have him back this year." Clackamas held Nova in check early in the game, but after 6-3 junior Derek D'Grigorio went down with a knee injury and left the game with 2:43 to play in the second quarter, the Cavaliers didn't have anyone with enough size and strength to contain the Pioneers' post. "What a tough player," Clackamas coach Cameron Mitchell said of Nova. "I mean, big, strong, athletic, and good finish with his right hand, left hand. We didn't really have an answer for him." The Cavaliers also didn't have an answer for Oregon City's zone defense, which the Pioneers broke out during the second half, remembering how effective the zone had worked in their two wins over Clackamas a year ago. "We played really hard that first half and then we got really frustrated and, to be honest, I thought we quit a little bit in the second half," Mitchell said. "Part of that is on me. I've got to get us more prepared. But I was disappointed with how we finished." 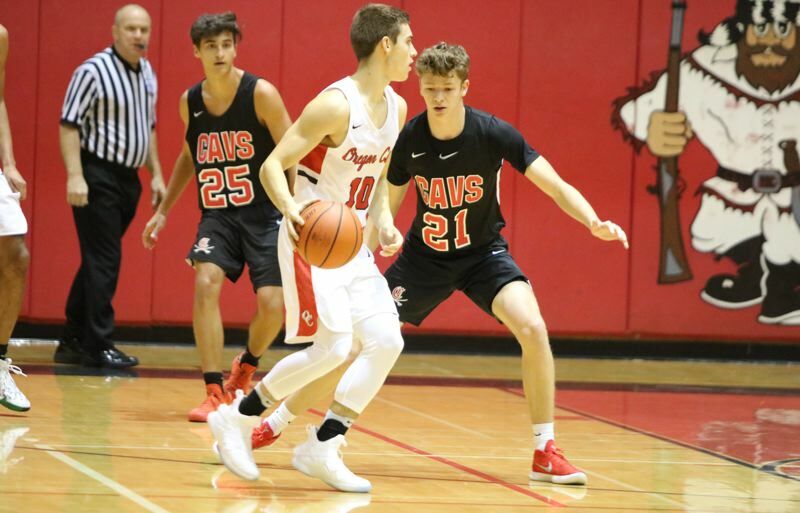 Clackamas returns only three players -- David Aspidov, D'Grigorio, and Gavrilovich -- with significant varsity experience, which translates into some early-season growing pains for the Cavaliers, especially if D'Grigorio has to miss significant time with his injury. "We have a lot of guys that are getting thrust into a new role and against a lot better competition, and it shows a little bit, but our goal is to keep continuing to improving," Mitchell said. "Because we are so new, I think we can take big steps from now until January and into February." Oregon City is working through some similar early-season challenges. "We have only three kids that have really played meaningful varsity minutes," Pioneers coach Aaron Newkirk said. "We do have some talented players, but they don't have a lot of experience in games at the varsity level. So, getting some of this experience is really valuable for them." Newkirk said the Pioneers were "a little out of sync on offense" against the Cavaliers, which is not that unusual when players are still getting used to playing with one another and figuring out where the ball needs to go in order to score. "That's also why we spend so much time on defense is for games like this when we are out of sync and we can rely on getting stops and making it hard for teams to score," Newkirk said. "I think Clackamas had four points in the second quarter and seven in the fourth. When you can hold a team in the 30s like we did tonight, you're going to have a pretty good opportunity to win no matter who you're playing." With the score tied 10-10, Oregon City's Andrew Talley hit a pair of shots to key a 9-4 run in the second quarter that gave the Pioneers a 19-14 halftime lead. 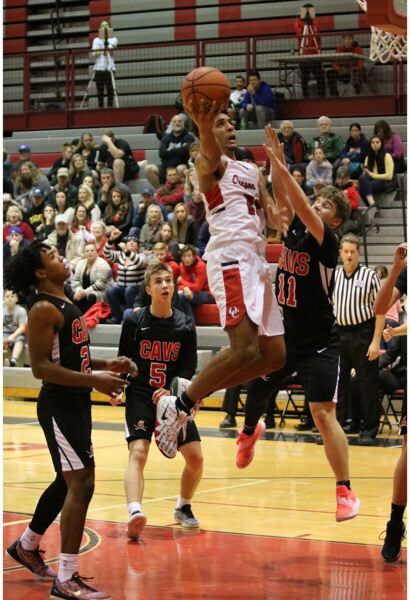 In the third quarter, Clackamas' Jailen Hammer made one of two free throws to pull the Cavaliers within 23-22 with 4:03 remaining, but the Pioneers answered with an 8-5 burst that pushed the lead to 31-27 entering the fourth quarter. Oregon City led 37-32 when Jake Gettel knocked down a 3-pointer from the left corner, Nova scored from inside, and Remsburg scored on a short jumper that put the game out of reach with just under two minutes to play. "It was a tough game," Remsburg said. "Our coach had been building this up as 'Rivalry Week,' so we've been going hard in practice, getting ready for that. It's always a fun game to play against Clackamas. "We knew once we got on 'em, we had to keep on 'em. Our coaches are always harping on defense, and all our guys play hard on defense. That was our focus tonight, because our shots weren't falling, but we were able to grind it out of defense."